OAK RIDGE, Tenn., Jan. 13, 2016 -- The Department of Energy's Oak Ridge National Laboratory and SCIEX of Framingham, Mass., have signed a licensing agreement for technologies that speed up, simplify and expand the use of analytic chemistry equipment. SCIEX is a leading manufacturer of mass spectrometers used to identify and characterize chemical compounds in a variety of industrial and academic fields. The ORNL-developed technologies, including an open port sampling probe, make it easier for non-experts to take advantage of the precision offered by mass spectrometry. These advances will help SCIEX expand mass spectrometry adoption to applications outside the laboratory, such as on-site security and forensics; process control; materials science, food and water safety; and noninvasive, point-of-care disease diagnosis. "Mass spectrometry is ideal for applications that require routine, rapid, highly simplified analyses, if the equipment could be simplified and made more rugged," said Tom Covey, SCIEX principal research scientist. "What has remained elusive to make this transition a reality, is the development of simplified, reliable, and universal techniques for transferring these types of samples from the world outside the laboratory into the mass spectrometer." Covey continued; "It is our opinion that the open port probe technologies developed at ORNL are the missing link to solve this difficult problem. It is our intention to work closely with ORNL to advance this technology to its fullest potential." These current ORNL technical advances build on more than 25 years of research in sampling and ionization systems for mass spectrometry funded by DOE's Office of Science. 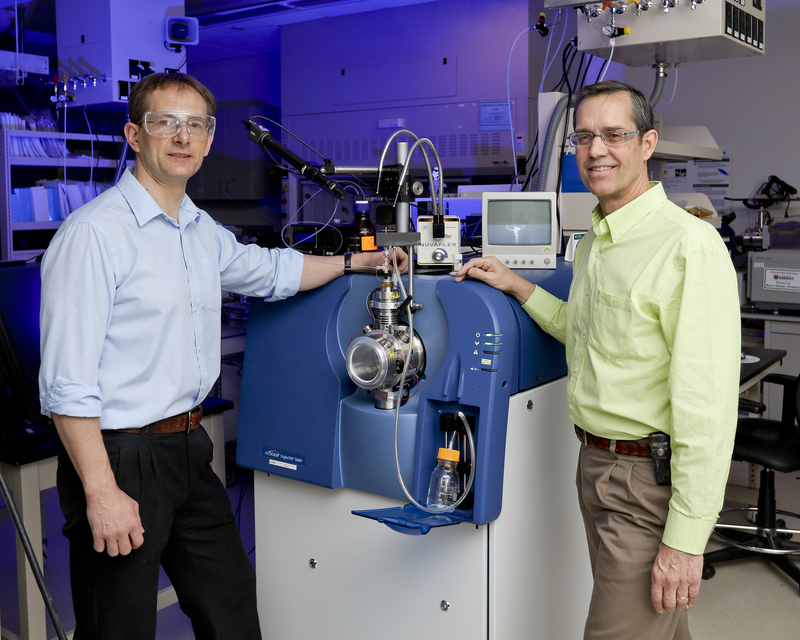 A team of researchers led by ORNL's Gary Van Berkel and Vilmos Kertesz has collaborated with SCIEX scientific staff under a cooperative research and development agreement since 1997. "Our goal is to advance analytical characterization techniques to make measurements that are necessary and important to the larger scientific mission," Van Berkel said. "The advances we make can be spun right into commercial products." ORNL and UT-Battelle work closely with licensees to ensure successful commercialization of licensed technologies. More information concerning licensing of ORNL technologies can be obtained at http://www.ornl.gov/partnerships/technology-licensing. Caption: An open port sampling probe developed by ORNL's Vilmos Kertesz (left) and Gary Van Berkel is among several mass spectrometry technologies licensed to SCIEX.